Richard Starkey, known professionally as Ringo Starr, is an English singer, songwriter, and actor from Liverpool. Starr gained worldwide fame as the drummer for the Beatles and is today considered to be the 10th richest rock star in the world. As of 2019, Ringo Starr’s net worth is roughly $350 Million dollars. Richard Starkey “Ringo Starr” was born in Dingle, Liverpool on the 7th of July, 1940. Starr was the only child of Richard Starkey and Elsie Gleave. At the age of 6, Starr developed appendicitis, which caused him to fall into a coma that lasted for a few days. After Starr was discharged from the hospital, he chose to not return to school and preferred to stay home instead, playing music. Ringo Starr began his musical career in a Skiffle band and took the nickname, ‘Ringo’ because of the number of rings he wore. By now, he already fully adopted the stage name ‘Ringo Starr’. In 1960, he met a Liverpool band ‘The Beatles’ and joined them two years later. In 1962, Starr has his first professional recording experience with the Beatles. The band took the world with storm and was considered to be the best band of all time. A few years later, Starr was once again given a chance to prove his acting abilities and also provided the vocals for the single ‘Act Naturally’. After an illness, he became more isolated than ever before. However, in 1966, he was given the role as the lead singer in the track ‘Yellow Submarine’. In 1992, Starr released his first studio album since 1983, ‘Time Takes Time’. Two years later, he started to work on the ‘Beatles Anthology’ project with the members of the Beatles. In 2012, he dropped the album ‘Ringo 2012’ and the following years the ‘All-Starr’ band announced that they would be touring the Pacific Rim the next year. As of 2019, Ringo Starr’s net worth is $350 Million dollars, making him the 10th richest rock star in the world. View our larger collection of the best Ringo Starr quotes! We have to pay our dues if we want to sing the blues… And you know it doesn’t come easy. Life is not always easy, so it’s important that we play the part if we wanna earn the part. Peace and love is the most important thing in the world. If we wanna achieve it we ALL have to work for it to come true. You either kiss the future or the past goodbye. Ringo Starr is one of the best drummers of all time. Much of his multi-million dollar fortune is from his time with the Beatles. The Beatles is today considered to be one of the most popular and best bands in the history. 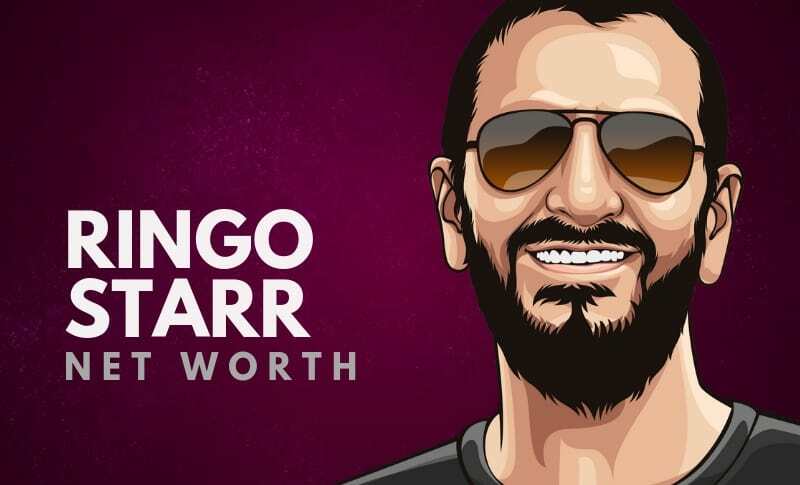 As of 2019, Ringo Starr’s net worth is estimated to be roughly $350 Million dollars, making him the 10th richest rock star in the world. What do you think about Ringo Starr’s net worth? Leave a comment below.